At 276 sq miles, the Isle of Anglesey is Wales’ largest island and a popular destination for visitors to North Wales. Anglesey boasts miles of inspiring coastline, secluded beaches and Wales’ greatest concentration of ancient heritage sites. Anglesey also offers visitors a warm welcome, beautiful scenery, the promise of amazing adventures and serious solitude if required. With so many places to visit, and easily accessible, this unique island with its serene coastline, riot of beaches and historical towns, makes an ideal family or romantic base. It’s pretty lively too, with an excellent programme of festivals celebrating local food, music, culture and the great outdoors. The Menai Bridge Food Slams is a great day & evening out and there is Anglesey Oyster Festival and Beaumaris food festivals to name but a few. Miles of scenic walks on the Isle of Anglesey Coastal Path and cycle paths await you, as do some of the best water based activities. Learn to windsurf, paddle board or kite surf with FunSport at Rhosneigr. If you prefer simply to watch, visit when the Great Strait Raft Run is held in early June or enjoy the two week long Menai Bridge Regatta from 30th July to 11th August where the sailing takes place on the Menai Strait, a narrow stretch of water separating Anglesey from mainland North Wales. 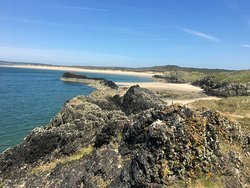 The walks on Anglesey are simply stunning and on any one walk you often see dramatic cliffs, grassy sand dunes, salt marshes, forests, pretty villages and of course miles and miles of golden sands. 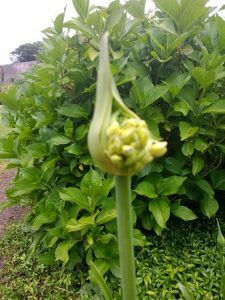 There is so much to be discovered and so many places to visit, from the islands rich culture and heritage and wonderful gardens to the unusual ‘moonscape’ landscapes that are home to an extraordinary amount of plants and wildlife. There are some fabulous gardens to visit whilst here – our favourites include Plas Newydd and Cadnant Hidden Gardens, both well worth a visit! Much of our coastline has been declared an Area of Outstanding Natural Beauty (AONB), and come rain or shine our fabulous beaches offer something for everyone – vast stretches of sand, safe swimming for the kids and windswept bays where a bracing walk and rock pooling are the call of the day and there are plenty of dog friendly beaches too with miles and miles of golden sands to let your pooch run like the wind! If you’re looking for an ideal base from which to explore the sights and sounds of Anglesey, look no further than our selection of holiday cottages in Anglesey. We have pet-friendly cottages, Anglesey cottages for families and Anglesey cottages for those seeking a romantic break. Or, if you’re looking for an outdoor adventure we have cottages located close to the Coastal Path and other major outdoor attractions. We’ve picked a few things to do when visiting the enchanted island of Anglesey. Visit Lleyn Peninsula, see the sites, take in the charm and stay in one of our beautiful Anglesey cottages. Newborough Beach (also known as Llanddwyn Bay) is a 3½ mile long sandy beach reaching from Llanddwyn Island to Abermenai Point. The beach is mostly fine sand with small amounts of shingle, backed by dunes. Behind the dunes are Newborough Forest and the nature reserve of Newborough Warren. Parking is at a car park in the forest, reached by turning off in Newborough village along Llys Rhosyr which leads to a toll road. Facilities at the car park include toilets, cold water showers, picnic tables, barbecue areas, cycle stands, drinking water and usually refreshment vans in summer. Access to the beach is a short walk over the dunes. Explore our selection of Anglesey Cottages. A historic garden under restoration, situated between Menai Bridge and Beaumaris on the Isle of Anglesey. In 1996, the present owner bought the 200 acre Plas Cadnant Estate and work began on the restoration of the historic garden and grounds. Since then large parts of the gardens have undergone a spectacular transformation and have been restored to their former glory. Explore our selection of Holiday Cottages Anglesey. Wide, sandy beach located just around the corner from the village of Moelfre. The beach of Traeth Lligwy is backed by low sand dunes giving it a wild, open feel, which is exactly what it is. At low tide a large expanse of firm sand is revealed providing all the space you could need for beach games of any description. 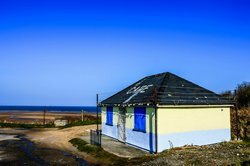 Along with a range of facilities including toilets, car parks and a shop this is a great family beach that still manges to retain a natural feel. Traeth Lligwy beach is also popular with water sports enthusiasts and can be good for windsurfing, kitesurfing and even surfing. St Edern’s Church, Bodedern (sometimes referred to as St Edeyrn’s Church) is a medieval parish church in the village of Bodedern, in Anglesey, north Wales. Although St Edern established a church in the area in the 6th century, the oldest parts of the present building date from the 14th century. Subsequent alterations include the addition of some windows in the 15th century, and a chancel, transept and porch in the 19th century, when the nave walls were largely rebuilt. 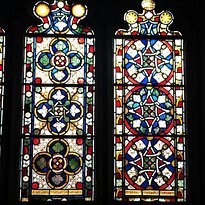 Stained glass was also inserted into the windows of the chancel and transept.